One hundred journalists from 55 countries discussed the role of media in building peace, at the five-day 2017 World Journalists Conference which was organized by Journalists Association of Korea in early April. The program included significant topics to discuss especially on conflict resolution and the role of media. The program started in Seoul and continued in other cities such as Suwon, Busan, Incheon. It was a valuable step of South Korea which will host Pyeongchang Winter Olympics next year, with the theme of peace against conflict. The Korean peninsula has several conflicts, not just the North Korean issue but some of them appear on its neighborhood. Historical and geographical conflicts with Japan are in the foreground. Japanese war crimes and comfort women scandals during the Second World War, stand as a critical problem among these countries. On the other hand, Japan stakes out a claim on Dokdo Island of South Korea. At the same time, East Sea is another discussion between two countries. Japanese side calls here as the Sea of Japan. South Korea claims that the term of Sea of Japan appeared while Korea was under the Japanese occupation. As an addition to the conflicts with Japan, THAAD issue stands as hot discussion nowadays. This negatively effected the relations between South Korea and China. China opposes South Korea’s decision to deploy the missile defense system. Beijing accepts this as a threat to its national security. So, Chinese government enforced sanctions to Korean investments in the country. The agenda about Park Geun-hye, former president of South Korea, who was impeachment by Constitutional Court in March 2017, was a hot issue. This also effected the political situation and can be accepted as a tiring effect for the country. The initiative of nuclear weapon tests of North Korea is quite another problem of the peninsula. This stands as a radical threat to the regional security, also global security. Thus, South Korea follows an effective way to draw the world public attention. Media members play a key role in this mission and can give a shape to global peace. In the most remarkable moment, Chinese and American participants were delivering their opinions on regional problems. The Chinese side is strongly against to THAAD system and they assume it will bring other problems together in the near future. But Americans think differently and they believe the only US can play a significant role for this aim. It seems that the destiny of East Asia totally depends on variables among China, US, South Korea, North Korea and Japan. One of the most important meetings was held with Choi Moon-soon, the governor of Gangwon province. Along with his hilarious presentation to the world journalists, he mentioned important facts and expectations about the peninsula. Before the division of Korea in 1945, Gangwon and its North Korean neighbor Kangwon formed a single province, so another half is located in North Korea. He pointed out the sharp differences of two halves by mentioning the rapid progress of South Korea. 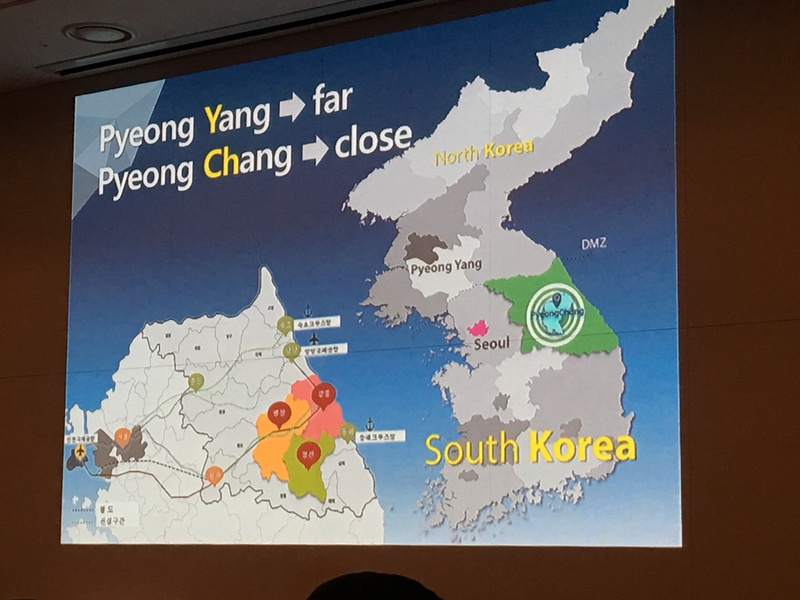 Also, Pyeongchang county which will host 2018 Winter Olympics, locates here. Hereby, 2018 will be a meaningful year to see peaceful initiatives of South Korea. Mr. Choi also underlined another interesting fact about Pyeongchang and Pyongyang. According to his words, Pyeongchang promotes peace but Pyongyang is becoming a symbol of war and destruction. South Korea rises as a peaceful power in the world. Balance protecting in East Asia is not easy but the decisions of Seoul will play a key role in the period of conflicts.